Pros: It has many data sources and very ease of use. I like also that you can include excel files or Google Sheets as sources so that you can create your custom data and even integrate via Zapier with this. Cons: It is still missing some key elements. For example, in the same chart, mix different data sources. Also, it needs to improve the look and feel of the charts. It is good and understandable (except very few quirks that support mentioned they are working on), but it lacks that "eye candy" in charts. Recently the development seemed stagnant, but since the last weeks they seem to be active. Overall: Show important data to customers in a simple and effective way. It saved us a LOT of time to create excel spreadsheets and create power points with charts. Right now, we just set up a dashboard, refresh whatever data is manual and present to customers. We cut off approximately 70% of manual work on sharing performance metrics and charts to our customers. Pros: Easy to use, nice interface, ability to integrate 3rd party data, and the reports are attractive an dynamic. Cons: Very limited in being able to whitelabel and easily share reports without having to sign into DataDeck or see a button/link to join. I'd rather the people we share these reports with just look at the data, not be badgered to open a DataDeck account. Overall: I rarely use it and will be sticking with Google Data Studio for now. If DD changes their sharing functionality, I may consider making it my primary reporting tool. When it comes to white labeling, we are currently aiming towards team collaboration around data. Which means we are working on other features that support working together. White label is 100% a great feature for agencies, but does not have our highest priority at this time. Hope this clarifies some of your feedback. I was looking for an easy way to dashboard all my data. DataDeck is the answer. Pros: Easy to use. Easy to share with url/password. 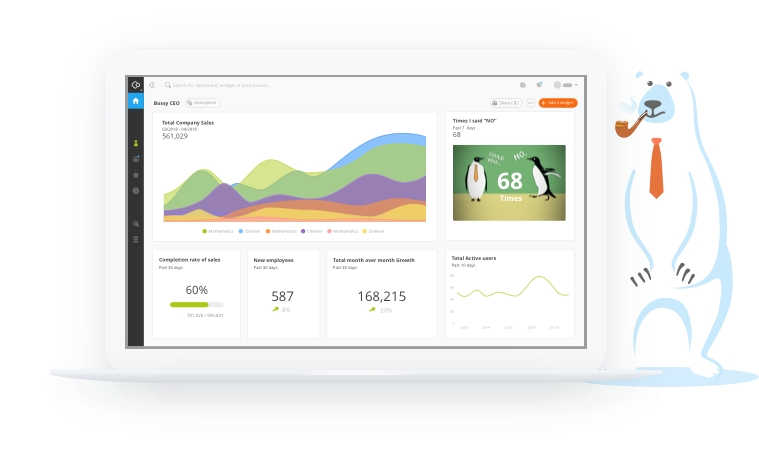 Easy to build custom dashboards to curate the data for those who are less data hungry than others. Cons: Not as many native connectors to external data sources as I'd like. Although with Zapier integration, there are almost no limits (but not everyone has/wants Zapier). Getting social media follower data such as number of followers is not easy. 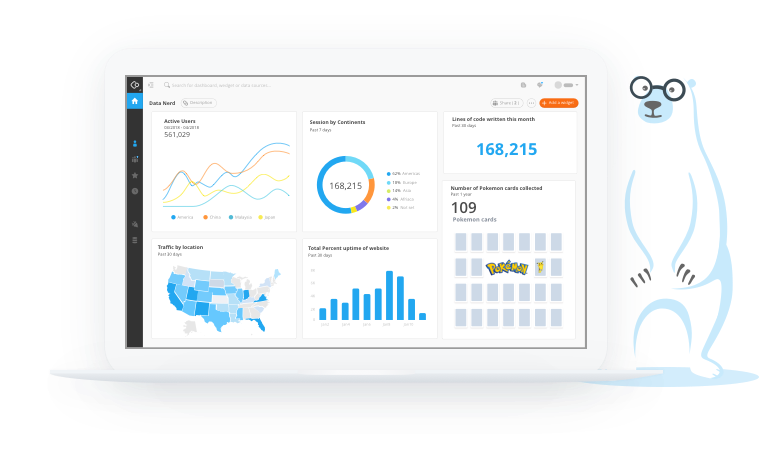 Overall: I'm able to create custom dashboards for myself and clients without the data overload by curating the data to prevent data overload. Pros: Incredibly fast to set up and integrate with a number of data sources and apps; with DataDeck I can set up templates in real time with clients, in minutes: Very user friendly. Cons: The dashboard is a bit limited in look and feel, and isn't as customizable as some other options out there in terms of pulling interrelated data fields or dependent type data scenarios. 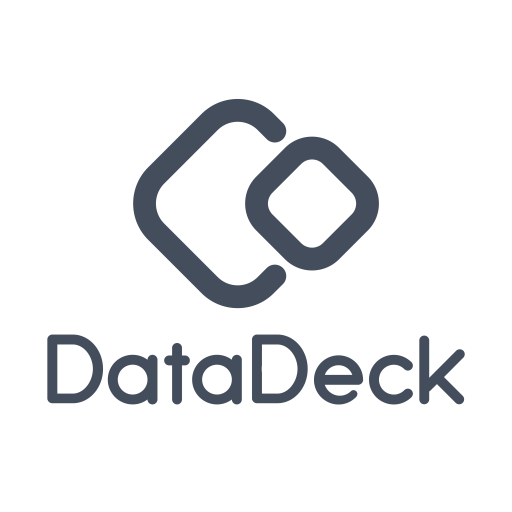 Overall: There are other apps out there that will get me the data results and functionality I need as fast and as hassle free as DataDeck will - but they cost a considerable amount more and require far more time to set up. 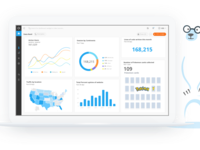 With DataDeck I can set up integrations and create data pulls and dashboards on the fly with clients and turn their data into something visual - which is a real game changer. Pros: DataDeck allows me to generate easy to use dashboards with customized widgets of information directly from my google sheets. The tool is intuitive to use. The reports I generate are easy to share with my team mates. The team behind this have been continuously improving DataDeck by implementing new features from their roadmap. The support team is very responsive and are prompt in providing guidance. Cons: My needs are not very complex, as I am just trying to summarize information from google sheets. 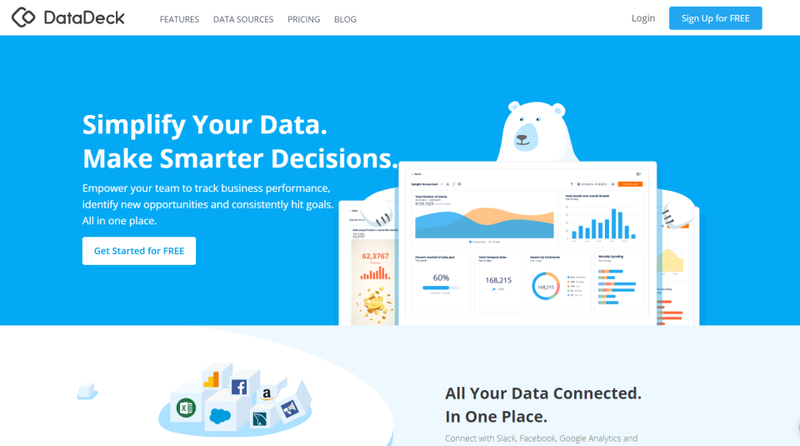 DataDeck in its current form would serve small sized businesses and teams. I feel that for more advanced enterprise level requirements, I would feel a little iffy to try this out. I don't think DataDeck is there yet to compete with the likes of Tableau, QlikView and SpotFire. DataDeck's functionalities are improving, but it will take them time. I hope they make it to the big leagues some day. Overall: Simplicity and speed via productivity. Pros: it was really an easy start with datadeck. it's one of these software you start with ease and find step by step into it. the best of datadeck is maybe the support team. 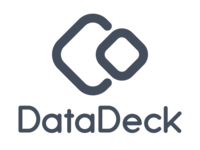 i really never found a more kind, friendly and skilled support behind an saas solution like the guys of datadeck. Cons: Not every source available to use for data analysis. Overall: Great product with cool design. Easy to use and set up and makes throwing up dashboards for teams easy. Pros: Once setup, Datadeck does a great job of helping me visualize how my business is doing at a glance. Cons: There are still some integrations that I wish that were available to be added to the dashboards. What data sources are you looking for? You could connect with our Zapier connection to connect to over 1000+ different sources. Pros: Fast, easy to use. Lots of different datasources and the custom datasources works like a charm. Use the dashboards to display data in Microsoft Teams so our teams have al the relevant information in just a click away. Cons: Conversion from custom data from Excel datetime is not available in European. So I need the convert our data first. Would be nice to pre -select order of a column in a table view and to compare table data with previous period. Pros: The software does what it says and works ok. They offer a lot of integrations outside of the most popular apps. Dashboards are pretty easy to put together once you get the hang of the interface. Cons: The look of the dashboard has a lot to be desired and I have had many clients complain that the data is very hard to read and just looks plain boring, especially compared to some competitors. They offer templates but each of them are missing important elements and you cannot combine templates. Overall: There are better options out there right now that offer better dashboard experiences for serious marketers. Pros: What is there not to like about this software? But mostly, obviously, is having all data in one place. Very convenient. And let's not forget about the sharing and collaboration functionality. With over 100 data sources to chose from, we got all our data centralized. Cons: The sheer amount of datasources made us wonder If we were using the proper services for our use cases. But to be honest, that is not really a "con". I did make us rethink our software choises. Which is alway a good thing to do now and then. Overall: There was a learning curve, I would suggest not adding all your sources at once... But that was pure enthusiasm from pur side. Overall, DataDeck simplified looking at our data and make it more comprehensible. DataDeck customer support has been awesome as we've been creating our first set of dashboards. 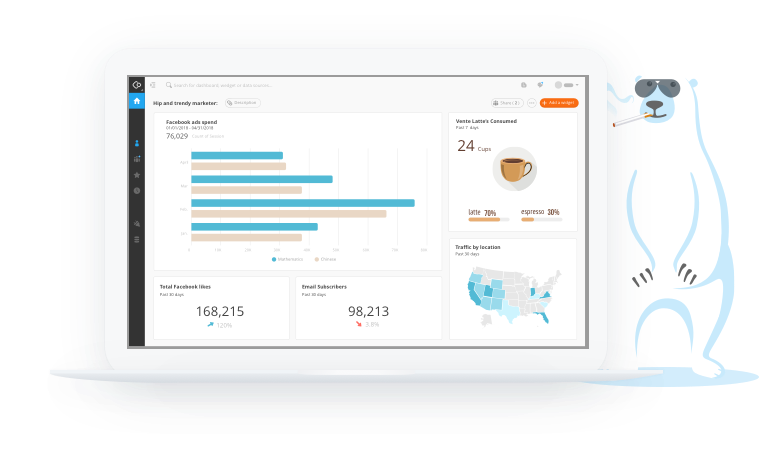 Pros: It's simple and easy to use, the dashboards refresh quickly and their customer support has been extremely responsive. The dashboard building tool is straightforward and allows us to create some data sets for our internal employees we otherwise wouldn't have been able to create. The final dashboards are also clean and easy to read, which is important for sharing data with non-data folks. Cons: Overall, we don't have any major cons at this time. The only con is we would love to see more native data connections sources added, as opposed to having to rely on something like Zapier to make those connections. thanks for your review. I'm curious to hear which of the more "robust" features made it hard for you to keep using Datadeck? Also we offer a free Hobby plan which sounds like a good fit if there is little budget for software like this. Pros: This was exactly what we were looking for. A simple software that takes data and spits out beautiful reports, what else coudl you ask? Cons: The pricing structure feels a bit strange. Pros: It is simple practice, for me this is worth a lot because there is not time to get every function in the middle of so much information, met my expectations. Cons: can be a problem if you do not know basic English. Thanks Igor for the review. I guess we need to start looking into multi language support ;) Adding Spanish and Portuguese. Pros: Lets you easily control the data being input from Google sources, and display it in any way you like. Cons: Massive ads for DataDeck every time I share a dashboard with a client. Never adding any new integrations, some things it should be able to do it just plain doesn't. Overall: I love the degree of customization I can get when working with Google Analytics. We have been taking your review very serious and I'm curious if you'd like to give Datadeck a new try. We added a bunch of new features, including a brand new UI, new integrations and data blending. I'm pretty sure you will like it and we love to get your feedback on it. Pros: Datadeck is able to compile, display and consolidate my website's data in one place at a glance. I am also able to do the same with my Facebook Page, viewing its statistics and visitors data in just a few clicks. Cons: Not all data is available or perhaps is still in beta phase. The idea is good, just need a few improvements here and there. Overall: Overall, I love the easy user interface and user experience. Graphs and data are well sorted out. Perhaps in future we can see more data on what we chose in the cards. One of the best app to analyse your data and create report ! Pros: Flexible, full of options and features, easy to customize, great dashboard an report and very great interface. Cons: I don't have any major cons at this time. I will just say that I'm just waiting for more native data connections. 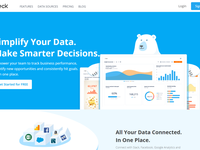 Concise platform to understand your data. Pros: I enjoyed the easy way to attach my data sources from google analytics and being able to display the important information for customers. Cons: I wanted a few more features to customize my dashboard. I originally bought the service because I loved the dashboard presented in the demos. I wish the platform came with templates that could mimic the setups found in the example dashboards. Frustrating. It looks like an abandoned product. Pros: - Easy to use and share with clients. - Very customizable which allows me to create a dashboard in my native language. Cons: - There is no roadmap. - Facebook, Paypal and Yandex are "coming soon" since forever. We added a bunch of new features, including a brand new UI, new integrations open roadmaps, weekly release notes and data blending. I'm pretty sure you will like it and we love to get your feedback on it. Pros: It was easy to get started and import data. I didn't need to go through documentations to get my dashboards up. Cons: If you have a lot of data on your dashboards they can take a long time to load. While using the app they may also start reloading randomly. Overall: All in all it was a good tool that allowed us to share client metrics. If you have any suggestion to improve Datadeck, feel free to mention them to us. Pros: Variety of the plugins, easy to use, user friendly interface. Went with Klipfolio, as datadeck just doesnt cut it with features. I use multiple social networks. Pros: Was easy to setup google analytics, but lacks all other necessary integration's to other social networks and tracking systems. We added a bunch of new features, including a brand new UI, new integrations and data blending. I'm pretty sure you will like it and love to get your feedback on it. Sharing Google Analytics Data with multiple people is easy with public links to dashboards! 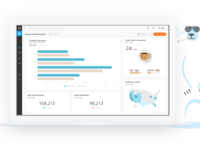 Pros: Data Deck makes it easy to simplify the immense amount of data in Google Analytics and share it widely across our organization. Cons: It would be nice to customize the dashboards with our own logo and color scheme. The dashboards are not very responsive to different desktop screen sizes, but there is a good mobile view. Easy to use interface. Excellent user experience. Pros: I mostly use it with CSV files and I like the Drag and Drop feature for CSV Columns. A user can easily generate Charts within few clicks. Overall: It helps you generate reports without any technical knowledge. 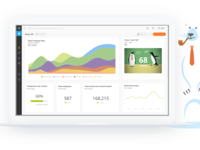 Pros: Analytical insights combined together for various platgorms. Cons: not really or not sure yey. lets see may be moretime..